It seems like a week can’t go by without the New York Times sharing a glowing review of the latest darling to emerge from the Portland Food Scene™. Who’s to blame? Did it start with Salt & Straw’s 27 year-old ice cream wunderkind or Andy Ricker and Pok Pok’s Thai empire? There are no easy answers, but dozens of Portland restaurants are on the “can’t miss” lists of insufferable yuppies from DTLA (aka Downtown Los Angeles) to Williamsburg. Are the Days of Undiscovered Portland Restaurants Gone? Spike, what do you think about Portland’s Food Scene™? Fortunately, he’s wrong. There are still at least a handful of great Portland restaurants only locals know about. Let’s look at six places you won’t hear about on TV—at least not yet. Wait, a brunch place in Portland without a two-hour wait? And it’s actually great? And it’s perfect for your vegan and gluten-free friends? A.N.D. Cafe is a vegetarian restaurant: everything can be made vegan, but eggs and cheese are on the menu. Even though it’s open until three in the afternoon and has a pretty robust lunch menu, it’s the perfect Sunday brunch spot. On most days, you won’t be waiting long for a table, but that doesn’t mean the food isn’t fantastic. From biscuits and gravy to waffles, nearly everything can be made gluten free. And you can choose from either poached eggs (organic and free range, of course) or scrambled tofu to go with your Benedict. The Bloody Marys are huge and can even be made with everyone’s favorite local hot sauce, Secret Aardvark. Even the coffee is local and comes from underappreciated roaster Cellar Door Coffee. Don’t forget to ask about the specials, which are usually a sandwich, kale-based bowl, or some kind of crazy and delicious stuffed waffle concoction. 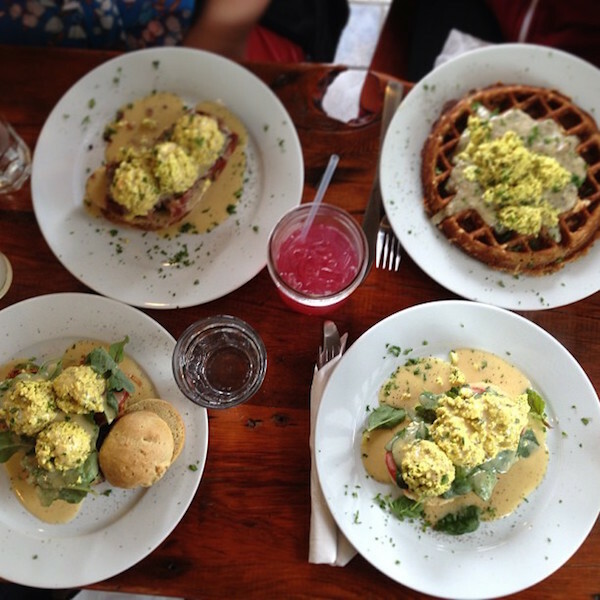 Top Pick: Meatloaf Benedict with vegan Hollandaise and scrambled tofu. 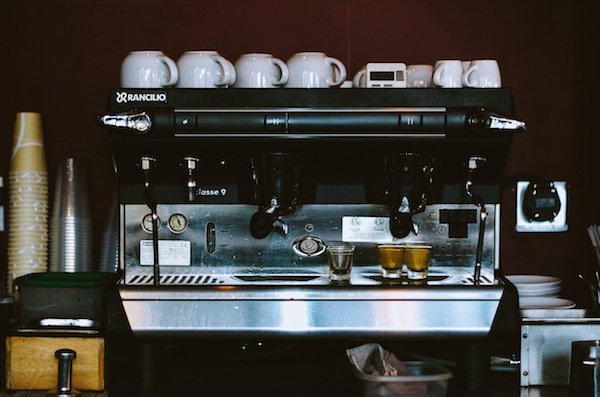 Do you know how to tell if a restaurant is successful? If they haven’t updated their website since the mid 1990’s, they’re probably doing pretty well. Why? Palio is located in Ladd’s Addition, right on Ladd’s Circle. It’s been a favorite spot for neighborhood residents for years. 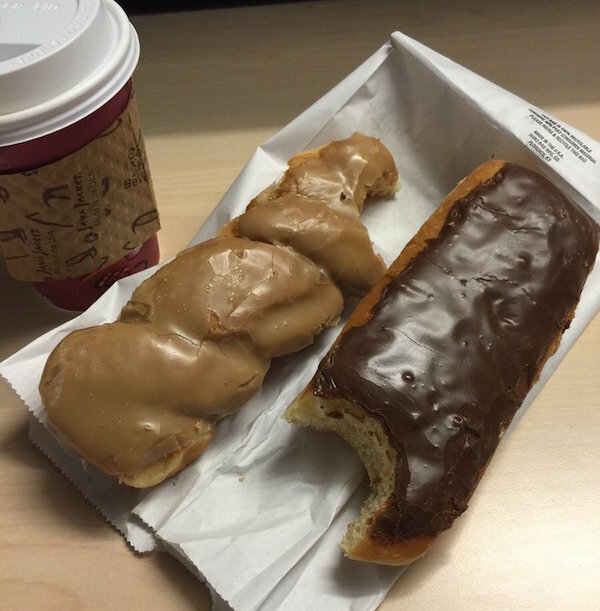 More recently, PSU, Lewis & Clark, OHSU, and University of Portland students have found it to be the perfect place to spend an evening cramming for midterms while nursing a cheap cup of coffee and nibbling on some of the best cake in Portland. The coffee and tea selections are great, but it’s the desserts that take Palio to another level. There’s always an incredible variety of beautiful cakes, pies, and tarts from Piece of Cake in Sellwood. I dare you to not order a slice of Fantasy Cake. Before you ask, it’s a layer of chocolate cake, topped with a layer of cheesecake, all covered in cream cheese frosting. Plus, Palio is open until 11PM, a real rarity among Portland’s non-bar establishments. Rookie Mistake: Asking if everything at Palio is actually Paleo-friendly. You may as well pronounce Couch like the furniture while you’re at it. 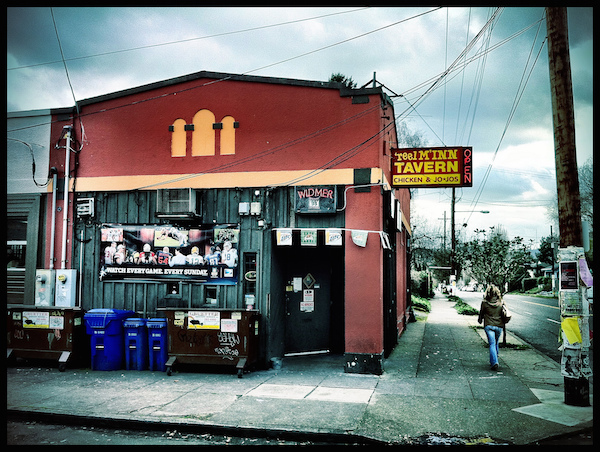 The Reel M’ Inn is a real legend in Portland and one of the last surviving Old Portland establishments on lower Division (tech bros might know it better as D-Street). From the outside it might look like any other run down dive bar just a few hours away from being demolished and turned into a cookie-cutter condo building. But inside you’ll find some of Portland’s best fried chicken and jojos. If you don’t know what a jojo is, you really haven’t been in Oregon long enough. It’s one of the state’s most unique words, according to a recent study. Everywhere else, they’re just called potato wedges, but in Oregon, they’re called jojos. Yeah, we don’t get it either. The chicken at the Reel M’ Inn has been made the same way for over 20 years. Fried one order at a time by the bartender. The chicken is from the local Draper Valley Farms and is never ever frozen. How popular is the Reel M’ Inn? About 800 pounds of chicken and 350 pounds of potatoes get fried up every week! Rumor has it their location is only leased through 2019, so get there while you still can. Liquor License: Occasionally revoked for mysterious reasons. In the time it takes you to read this article, you could leave the 90 minute line at that other Portland doughnut place and take an incredibly leisurely walk across the Burnside Bridge and find yourself at Delicious Donuts, home of the true best donuts in Portland. And instead of $4 brioche donuts (Ooh-la-la, Mr. Fancy Man!) from another touristy Portland donut spot, you can get a glazed donut for about a buck. If you’re looking for gourmet, look someplace else. There’s nothing here but classic and delicious donuts. You’ll find sprinkled donuts, cake donuts, buttermilk bars, old-fashioned donuts made with sour cream, powdered sugar and cinnamon dusted donuts, jelly filled donuts, and of course Boston cream donuts. And Delicious Donuts passes the one true test of a great donut joint. Stop by at about 6 in the morning and you’ll find the small parking lot filled with police cars. Not only is it the best donut shop in Portland, it’s the safest. Quick Aside: If the coin flip to decide Portland’s name went the other way, would there be a Portland Cream Pie? There’s room on this list for one semi-upscale (at least by Portland standards) restaurant on this list, right? Dove Vivi isn’t like any other pizza place in Portland. The crusts are deep dish and they’re made from cornmeal (but they’re not gluten free!). The toppings and the cheese are pretty standard, for the most part, with popular pies featuring sausage, pepperoni, onions, and peppers. 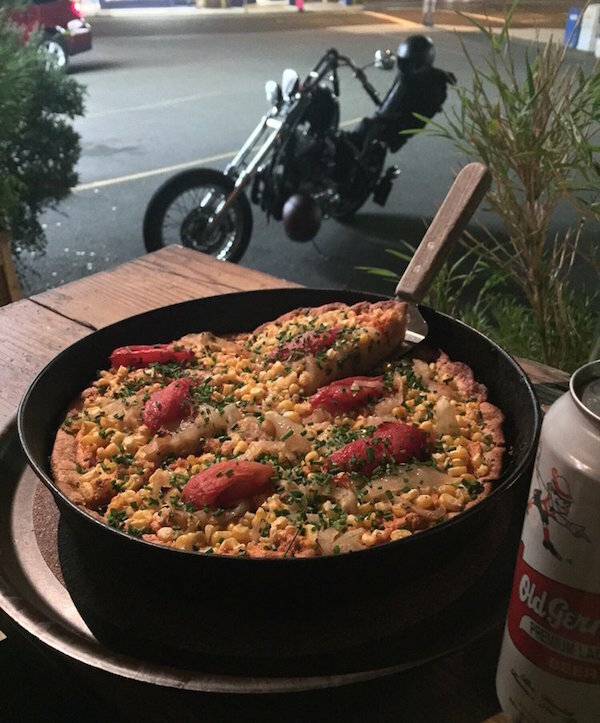 But they do offer some uniquely Portland twists, including corn and goat cheese topped pizzas and a pizza with eggplant and blue cheese. But the real star is a vegan pizza with cashew cheese, sweet corn, caramelized onions, and house-smoked tomatoes. You’ve never had anything like it, guaranteed. Nearby Dessert: Too well-known to make this list on its own, pop across the street to Pambiche for traditional Cuban flan and a Cafe Cubano. 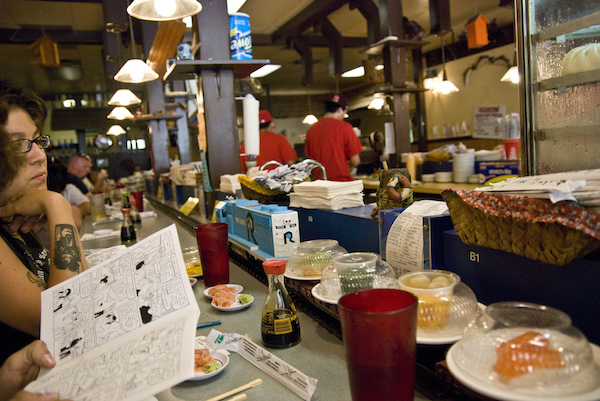 Who doesn’t love sushi served on a model train while music from old-school Nintendo games plays on the stereo? That’s the best way to describe the vibe of Sushi Ichiban, located next to a grimy auto body shop and SRO hotel on NW Broadway. The plates are cheap, with most ranging from $1.50 to $3, with half price rolls on Saturday afternoons. Their tempura and Hamachi are both particularly popular and well-reviewed on Yelp. But be warned, if you’re the sort of uptight party pooper who’s always asking questions like, “Is this fish sustainable?” and “How old is this rice?” you might want to try somewhere else. Request: Mega Man IV theme song. On repeat. Now For the Love of God, Don’t Tell Anyone! You’re now trusted with some very powerful knowledge to use on your next visit to Portland. Or if you already live in Portland and haven’t tried any of these places yet, what are you waiting for? Get out and enjoy these last little tastes of Old Portland before they’re gone forever. Just whatever you do, don’t tell anyone else about this article. Especially not anyone who’s going to want to move here, feature these restaurants on Anthony Bourdain’s show, buy them out and double the prices, or create another disgusting collaboration with Rogue Ales & Spirits.